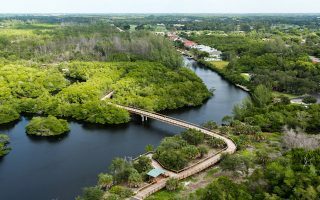 This is our guide to the best places to run in the Naples-Fort Myers area, including Sanibel, Captiva, and Bonita Springs. 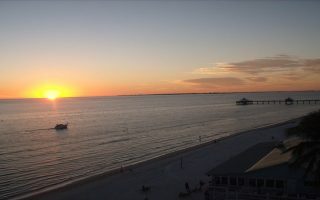 Located in southwest Florida on the ‘Paradise Coast’, Naples and Fort Myers are 45 miles apart, bordered by the gentle waters of the Gulf of Mexico to the west, and the Everglades to the south. 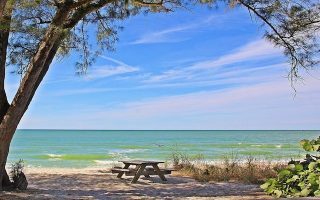 Some of the best beach running in Florida is located in this area, as well as wonderful running around bays, parks, tony neighborhoods, and greenways. 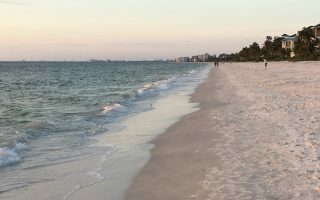 The running highlight in the Fort Myers area is a nearly continuous beach, starting with 7-mile long Fort Myers Beach and heading south toward Naples, including Lovers Key State Park (which also has 5 miles of trails), Bonita Beach, Barefoot Beach, and Delnor-Wiggins State Park. 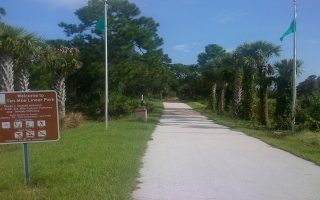 The 5-mile Linear Park between Cypress Six Mile Parkway & Colonial Boulevard is the best off-road trail in Ft. Myers. And just southwest of Ft. Myers, Sanibel/Captiva Island has some great running options and a wonderful beach. Naples is well known for its high-end shopping, world-class culture and sophisticated dining. 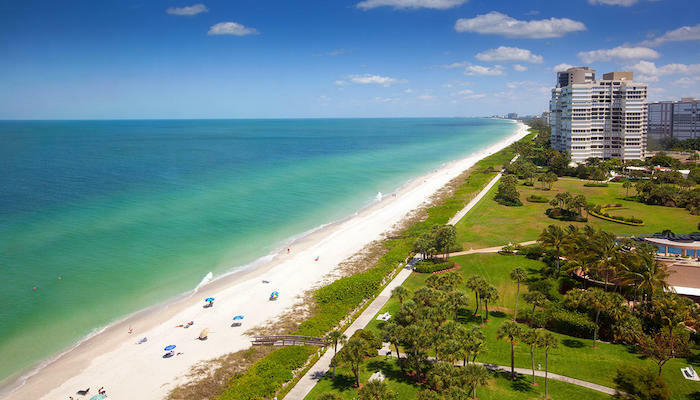 The best running near downtown Naples is along Gulf Shore Boulevard and Gordon Road, with views of the water, and some of Naples’ loveliest hotels and homes. 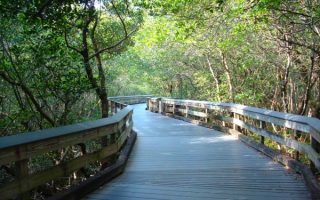 Just north of downtown, there are some neat boardwalk and trail runs through Everglades-like foliage, along the Gordon River Greenway and Freedom Park. Still further north, the Pelican Blvd./Artis arts center are terrific, as are nearby Clam Shell Park and the Delnor-Wiggins Nature Trail. 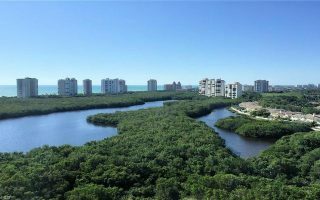 South of Naples, there is fantastic running on tony and bucolic Marco Island. The best beachside running in the heart of Naples. Starting at Lowedermilk Park, and running south along Gulf Shore Drive and Gordon Drive, it is about 4.5 miles one way. The paths and boardwalk around the Gordon River are like taking a run through the Everglades. 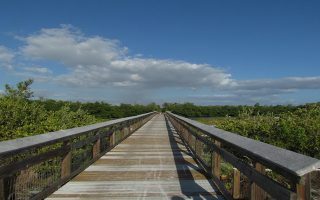 Elevated boardwalk sections over wetlands, where you can watch for birds, tortoises, and other wildlife. A great add-on to the Gordon River Greenway. It’s just to the north of the Greenway. 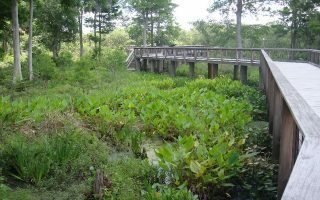 There are about 2 miles of pedestrian-only trails, mainly a boardwalk going over a swampy area. A run along Pelican Bay Blvd., 7 miles north of downtown Naples, is a great way to experience the waterfront, lovely foliage, and gorgeous Florida homes. A popular beach access points.The boardwalk runs through a mangrove forest of salt-tolerant red, white and black mangroves. It also has a tidal bay area. This barrier island is one of the loveliest spots in southwest Florida. Our route follows the course of the Marco Island 5k, through lovely residential areas. One of the hillier runs in S. Florida. 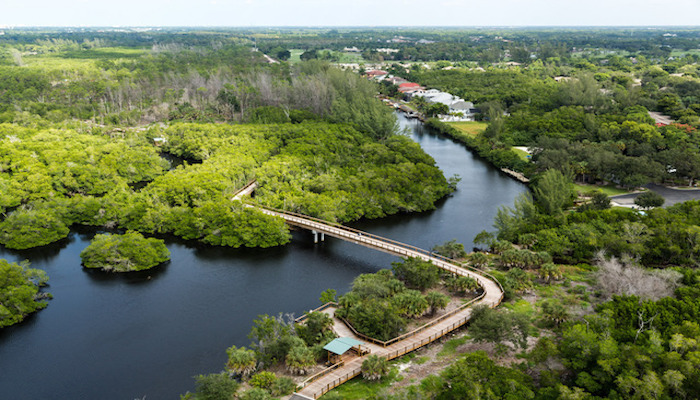 The Bird Rookery Swamp Trail is 25 miles north of Naples, and offers 12 miles of hiking and biking trails. 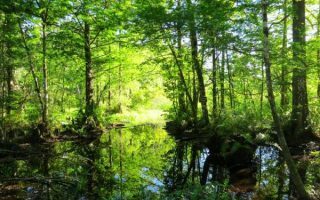 Starts with a 1500-ft. boardwalk, then becomes ground level, with swamp on both sides. Seven miles of beach running heaven on Estero Island. Cross the bridge, find a parking place, and enjoy running this wide, flat beach. Can be combined with 5 miles of trails at Lovers Key State Park at the southern end. Wonderful beach running in area between Ft. Myers & Naples. Bonita Beach is 2.5 miles and adjoining Barefoot Beach is ~3 miles. Scenic and flat, generally good sand for running. Can also run on Hickory Blvd. & Barefoot Blvd. See info on private community. A boardwalk through a tangled coastal tropical forest, and then a nice walk along the beach. Popular area with beachgoers. McGregor Blvd., with its palm-lined way and wide sidewalks, is popular with runners. Easy to do a straight shot from College Parkway to Midpoint Bridge or the Country Club. Whiskey Creek Dr. loop is another option. Popular islands reached by causeway from the mainland. We've recommended 4-5 of the best spots among the 22 miles of bike paths, 15 miles of (sometimes runnable) beach, and the Wildlife refuge. Naples has a subtropical climate, with temperate and generally dry weather from the late fall through late spring and hotter and more humid weather in the summer through early fall with typical tropical thunderstorms in the late afternoon giving way to beautiful sunsets. 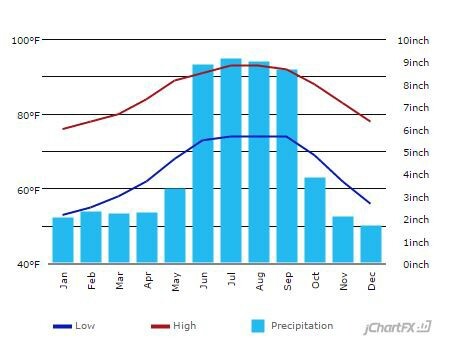 Summers are hot, humid, and wet with high temps often above 90F and rarely dipping below 70F. One must take caution when running in summer. Winter weather is delightful, but cooler than southern Florida. Average winter highs are in the 70s and lows in the 50s. For access to good running without getting in a car, try to stay at one of the hotels along the strip running from Pelican Bay in the north down to Royal Harbor on Naples Bay, to the west of Rt. 41 (Tamiami Trail). This provides access to running om the beach and Gordon Drive, and Pelican Bay Blvd. North Naples features hotels of greater budget range, in the Village on Venetian Bay and Artis Museum area. There are comfy lodgings within the walkable downtown, such as The Inn on Fifth and the Trianon Old Naples. For a romantic getaway, try the Lemon Tree Inn, a boutique hotel with an Old Florida vibe, where guest rooms are decorated in a tropical contemporary motif and feature all modern amenities. There is a large number of hotels on Marco Island. Marco Island Lakeside Inn, the quiet choice on the island. The Mariner is a great choice for families with its large suites. List of specific places to stay here. Naples on the Run: Has been servicing the Naples running and walking community for over 20 years. They pride themselves on their customer service and fitting their customers with the best shoe. Stop in for a free gait analysis, which enables them to properly fit you with the perfect shoe. Test it out on their treadmill too! Fit 2 Run: Fit2Run is a family owned company that prides itself on its strong community involvement and makes strides to empower athletes of all fitness levels to embrace a more active lifestyle. Voted “Best Running Shop” in the Southeast by Competitor Magazine readers. They have free weekly fun runs with themed nights, parties, clinics, nutrition samplings and more, and Train2Run training programs. Programs for all levels are available. Group and training run calendar. Group runs, Tuesday and Thursday 6:30 pm from store. GCR hosts 21 races a year in Naples, including the Naples Daily News Half Marathon. It offers training for beginning runners and has developed three popular routes for all levels of runners. The group meets three times a week, year round, for a run, unless there is a local race. Find a full list of their group meet times and more on their social calendar. Naples area running event calendar. Naples Daily News Half Marathon: January. Course Map The course is USATF certified and begins on 5th Avenue South and returns to Cambier Park. 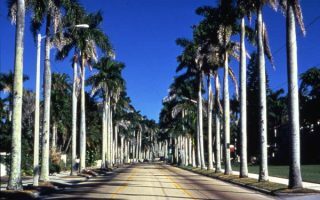 Run along a fast and very flat out-and-back course through the area known to locals as the “Olde Naples” section of town. This course takes runners through the city streets, residential neighborhoods and waterfront districts. One of the race’s really interesting and unique traditions takes place along the stretch on Galleon Drive, where a clergyman at Trinity-by-the-Cove Episcopal Church blesses the runners passing by (all runners pass by the church twice during the race) with holy water, which has become a landmark many runners look forward to in the race each year. 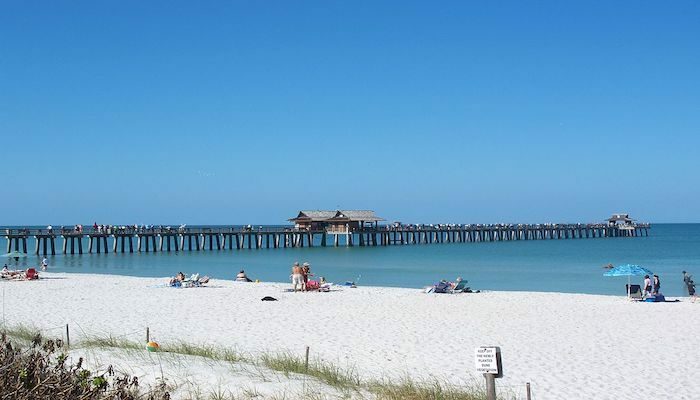 Paradise Coast Half Marathon: Naples, Florida is home to some of the most beautiful beaches, fine dining, high end fashion shops and is a prime destination for a half marathon and 5k. The race course will take you past some of the most beautiful natural scenery, luxurious homes, and friendly fans cheering you on along the way. Starting and finishing at the Florida Sports Club, the race takes runners through Naples and nearby Lely Resort. With the number of celebrities and public figures who call Naples home at least part of the time, who knows: you might spot a celebrity or two on the course. Racers finish on Victory Lane of the “World Famous Swamp Buggy Races” track.